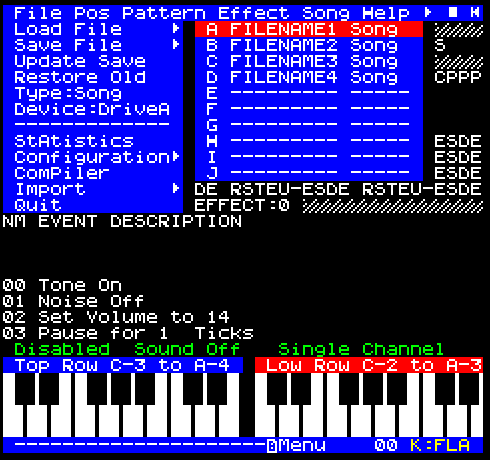 I am currently writing a new music editor for the Oric Atmos. You'll all be pleased to know i have finished some initial tests of the sound routines and they work fine. I now have to add some more commands and test the rest of the editor. Their are still loads to do, like i have disk directory working but load/save not done yet (Using sedoric under asm for the first time!!) and no SID code added yet. Memory is also getting tight, but i believe it won't be a problem. Anyway here is a demo of what i have so far. Load under Sedoric, then you can see directory stuff. The menus have been my biggest triumph so far. Although i still plan to code ESC to quit a submenu (Currently left cursor). Return to enter an editor from menus, -/= to mod values, Right cursor to enter submenus or cursor down to select submenu from top. Many menu options are not working yet. But simple music is possible, just remember no save/load facility atm. Please note for the time being, 10 music files are permitted for any given disc. I have had problems finding memory to store the directory and facilitate a scrolling/page selection thing. This last one shows how the Effect/Pattern split can be moved (5 settings)so either allowing a bigger pattern or Effect area. 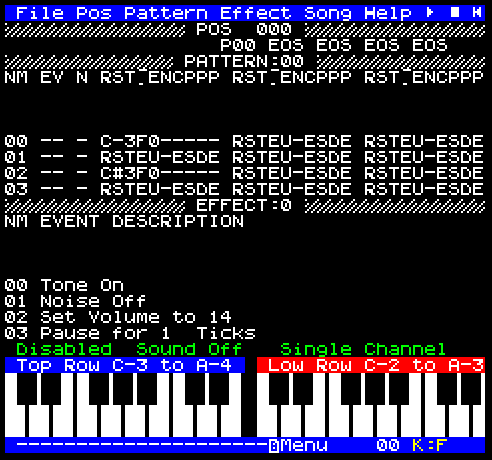 Type the Key sequence (from menu) FCE to access help screen for keys in any editor, though only first three work atm. 12012007-02 Volume in effect Set volume goes from 14 to 16!! Last edited by Twilighte on Tue Feb 27, 2007 10:21 pm, edited 1 time in total. Will it have any differeant abilities to your previous editors ? 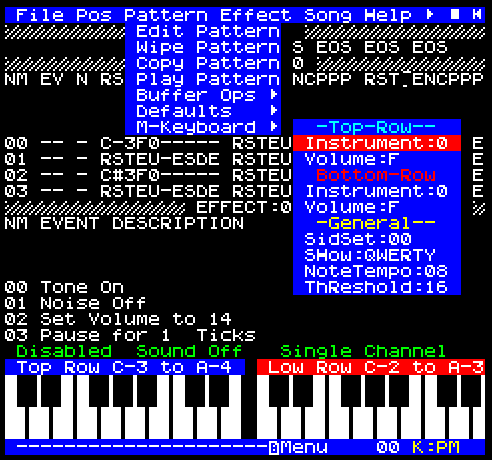 Yes, for yourself, it will have the ability to enter notes through the Virtual musical keyboard, whereby each physical Oric key will be mapped to a piano musical key. Stuff like QWERTY being CDEFGA white notes and 23567 black notes. The range is as per the screen shot whilst the octave is completely configurable. This method of entry will be accessable from the Pattern Editor and the input will be stepped or timed depending on your choice. Their will also be a completely configurable SIDSound engine plus Digidrum. The menu system has completely changed too, and their are way too many other enhancements to mention here. The demo previously supplied only contains a fraction of the available functions, since it was an extremely early development version. A new version will appear here within the next couple of weeks. So much new stuff done now, i had tried to implement SidSound but it was so difficult to get the correct frequency i have dropped it for the initial version. As Dbug said, let people give feedback and then make such enhancements. Anyway, the current version has some major enhancements and loads of bugs fixed. 9) And probably half a dozen other enhancements i forgot to mention. Have a look, and to fully test it, ensure you have disc system running, currently no protection against you attempting to use disc commands on non-disc system. 26022007-05 Corrupt Effect title - Leftmost character is "-"
Except this I was not able to do much things, except having "boing" sound in the instrument editor. Looks like the only thing we can do is to move up and down to select a line in the effect, and press space to switch between two values ? Seriously, you don't need to write a full documentation, but at least a minimum of explanations about what is doable and how to do it - even better, release it as a DSK file with a sample music ? - would make the result of the test way more useful for you. All I can say is that the menu system is cool. I have no idea what the texts mean: Nm probably stands for Number, EV for Event, but what are N RST EONCPP ? The colour cycling aswell as many other features are all configurable which in the next version (Version 0.6) will be loaded at bootup and saved on exit. The alternate mode is a plain red cursor. 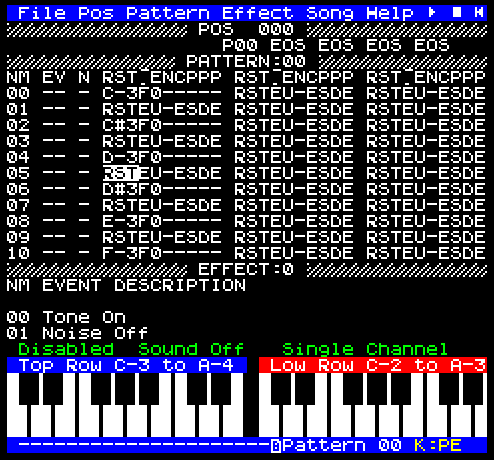 Dbug wrote: Except this I was not able to do much things, except having "boing" sound in the instrument editor. Looks like the only thing we can do is to move up and down to select a line in the effect, and press space to switch between two values ? Ok, their are currently 3 ways to get information on how to use this tracker. 2) Look at the Manual. The manual provides all information about AT although it can seem a little daunting at first. 3) Play around with the Tracker itself. The last version had a couple of demo songs on the disc. The only harm you can really do is to overwrite them which isn't much since you can always download again. Dbug wrote: Seriously, you don't need to write a full documentation, but at least a minimum of explanations about what is doable and how to do it - even better, release it as a DSK file with a sample music ? - would make the result of the test way more useful for you. Apologies People but i have decided to stop development of this utility since it has been superceded by AYT (See other message), an 8 Track Tracker for your Atmos and D/D.